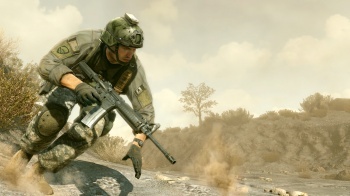 Starting with Medal of Honor, future PlayStation 3 games will require jailbreakers to update their consoles. Piracy keeps getting tougher for PlayStation 3 users, assuming they're actually using a recent PS3 jailbreaking method for piracy. Pirates, and those using it for "legitimate" purposes (if these people exist), will find it a lot harder to play newer games due to a now required install of jailbreak-killing firmware update 3.42. Medal of Honor is the first game to enforce the update to 3.42, and it can't be played without installing new firmware. Future titles will also make this update mandatory. The jailbreaking method on the PS3 mostly requires a USB device, which firmware 3.42 blocks, so this is one more way for Sony to stick its tongue out at pirates. Games like Medal of Honor are apparently encrypted with a key new to firmware 3.42 that earlier firmware versions cannot read. Sony hopes that this key will keep the PlayStation 3 from being flooded with pirated titles. A workaround isn't currently available, which means that PS3 users have to choose a jailbroken console, or the ability to play new games. Hackers always seem to find a way around the latest methods that stop them, but it seems that Sony is putting up a pretty darned good fight.